There are many ways to acquire customers. Catalogers are generally locked-in to co-ops. Online marketers, for the better part of a decade, were generally locked-in to Google. 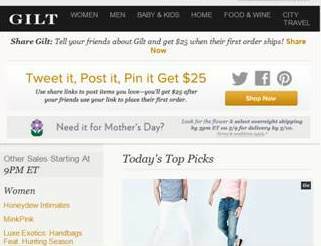 And, of course, you can use your own customers to do the work for you, like in this example from Gilt. In this example, you do the work via social media ... and when your friends use you link, you get $25. I'm not saying this will "scale" like renting 5,000,000 names from your favorite co-op at $0.06 each scales, but it's at least something worth thinking about. And that's what I'm encouraging here!